A few weeks ago, I met up with two lovely ladies to join a discussion about how Local Color Flowers could help grow creative conversation in our Baltimore community by teaching a terrarium class. As Lindsay Hite and Jessica D’Argenio Waller shared their vision for their newest project, Make Tribe, I grew more and more excited. Make Tribe would be a series of seasonal workshops for the sole purpose of sharing expertise, forging relationships, and feeding inspiration, and as we chatted I thought, “It’s happening!” This event is already encouraging creative conversation between us, and it hasn’t even begun! Naturally, Local Color Flowers jumped at the chance to partner with Make Tribe. As Lindsay and Jessica had explained, each Make Tribe event would be lead by a creative professional or “Partner” who wanted to share their expertise, but it wouldn’t be a class or lecture where you merely heard about their artform. Each event would be a workshop where you worked with your hands, got dirty, and took home a souvenir and a new skill. These parameters were of course a perfect fit for a terrarium class, and for Local Color Flowers since we love getting our hands dirty! The day of Make Tribe’s inaugural event, I showed up at the venue with trays of gorgeous locally grown succulents from Farmhouse Plants and Flowers in Brookeville, Maryland. Lindsay and Jess had the venue decorated to perfection with pretty signs, hanging garlands, chic cocktails, and Make Tribe souvenir booklets. Three long tables were set up in the middle of the room lined with supplies for building the terrariums. Waiting at each place setting was a different glass vessel, and as guests trickled in, they claimed their favorite one. I loved sharing my knowledge of terrariums with all the creative spirits who attended this event. The enthusiasm of every participant was supportive and infectious, and the conversational manner of the class opened the door for many questions, comments, and new friendships to form. Everyone’s personalities shone through in the terrariums they created; from which color succulents they choose, to the shape of their vessel, to the figurines and accents they added. Special thanks to Lindsay Hite of Make Tribe for these beautiful photos. To see more photos from the class take a look at our flickr site! It was truly wonderful to see such creativity blossoming all around, and to play a small part in bringing Make Tribe to life. Want to freshen up your front desk, waiting room, office, or showroom but don’t have the time or know-how? 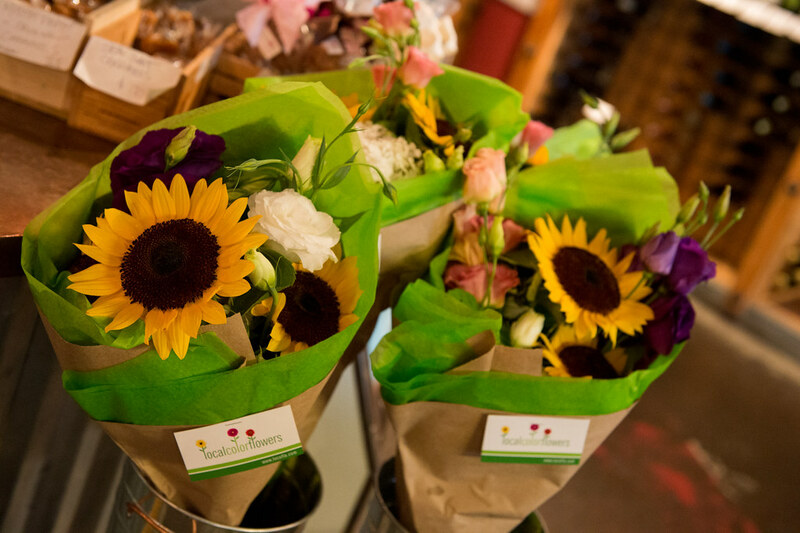 Local Color Flowers can help with our Business Floral Subscription! Sign up today, and soon your business will be filled with the scent of gorgeous, expertly designed, locally grown flowers. Here’s how it works. Our Business Floral Subscriptions are custom designed to fit your business’s unique needs. Whether you need a tall front desk arrangement, small waiting room design, head-turning window piece, or even a restroom budvase, we will listen to your requirements and provide you with floral designs that complement and enhance your business’s space. Depending on your business’s needs, your Floral Subscription can be delivered on a recurring basis, or picked up at our studio at 3100 Brentwood Avenue, Baltimore, MD 21218. Vases can be traded throughout your subscription so that as we give you a new arrangement, you return an old vase to us. 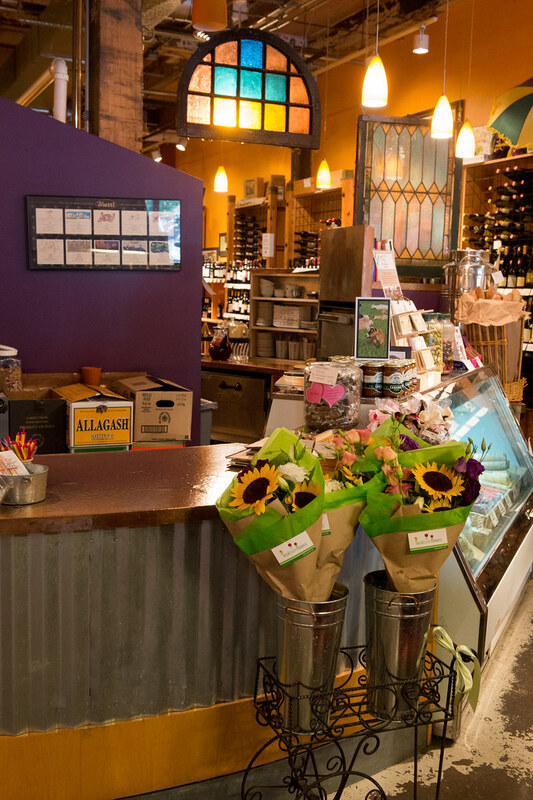 As always, all of Local Color Flowers’s floral designs are made from 100% locally grown flowers which means that your subscription will not only beautify your business, but help support our local economy as well. 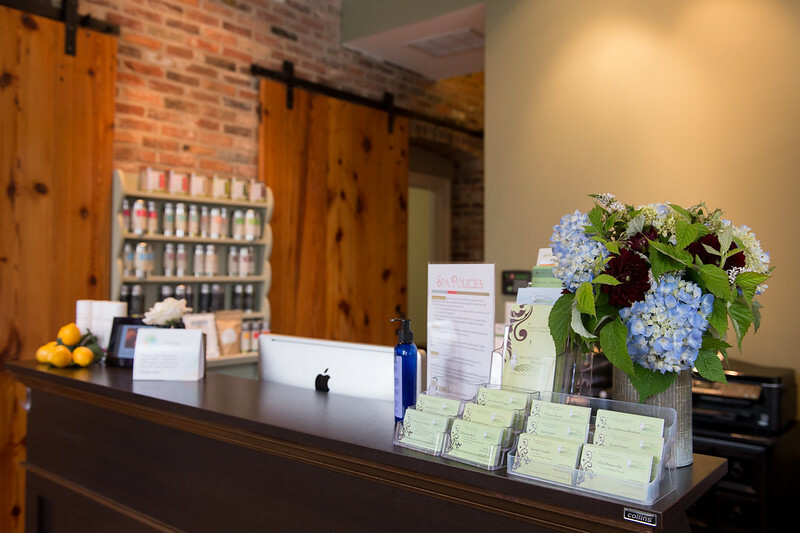 Apothecary Wellness Spa is one of our favorite business clients! 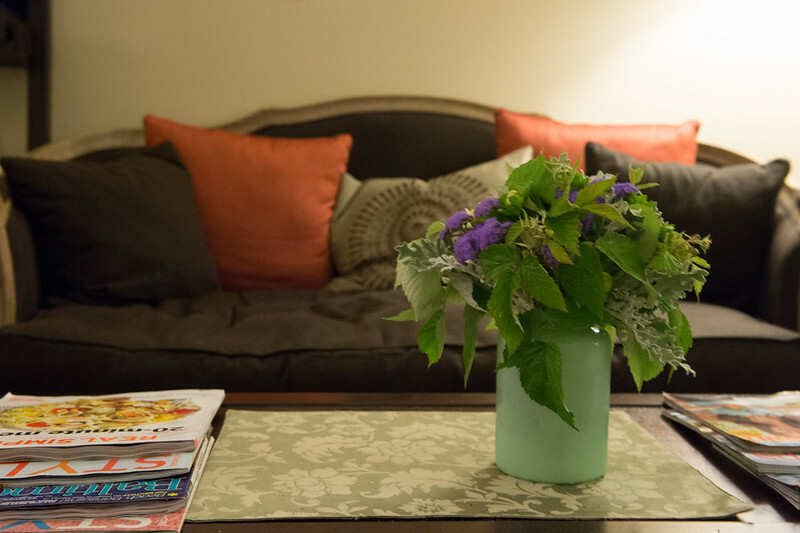 Having locally grown flowers in the spa is a perfect fit with their organic and green products and practices. Maya Kosok is the farmer behind Hillen Homestead. Hillen Homestead is a vacant lot Maya adopted from the city to grow flowers, fruit and berries. This sweet little farm is less than 2 miles from LoCoFlo’s studio! I first met Maya last winter in her role as founder of the Farm Alliance of Baltimore City. We got together to see if we could encourage urban farmers to grow flowers. Since our meeting 6 months ago, LoCoFlo’s been fortunate to be able to buy flowers, herbs, veggies and wheat grass from several Farm Alliance members including Butterbee Farm, Whitelock Community Farm, and Boone Street Farm. We’re excited to now be buying from Maya and Hillen Homestead as well. Our first purchase was for asclepias, ageratum and some gorgeous scabiosa. I used the scabiosa immediately as a perfect accent to some arrangements we provided for the Zoo last week. 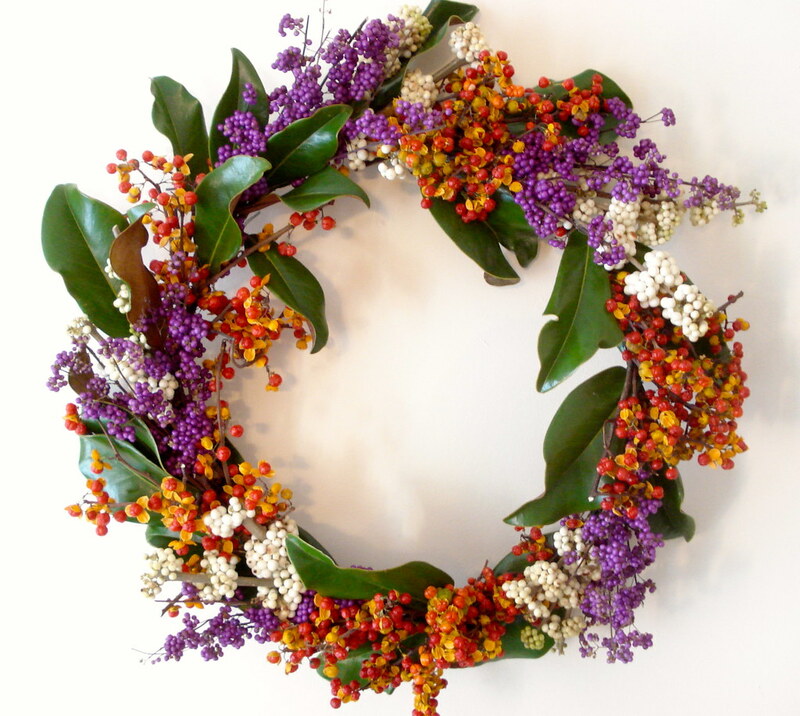 One of our goals this year was to help develop and buy from more Baltimore City flower growers. We’re super excited to add Hillen Homestead to our family of growers! When I was asked to design a 4ft long piece to go on a traditional alter, I knew that this would be our next “No Foam” design challenge. In the past, when creating a long, low piece like the one requested, we probably would have used some long tray filled with floral foam. Since we’ve given up floral foam, we had to strategize about an alternative. 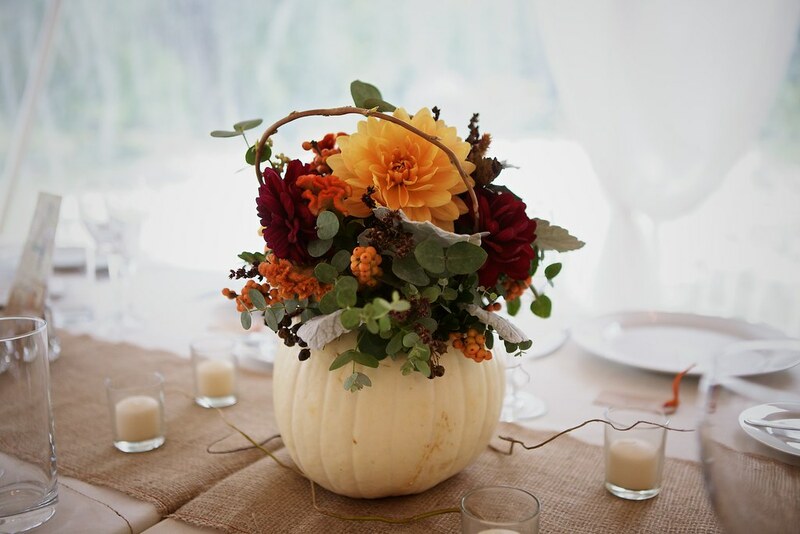 The bride’s mom shared this photo of an arrangement made by one of our favorite designers, Francoise Weeks as inspiration. She liked the arrangement but wanted just a splash of color. Our thought was to make the arrangement in pieces for ease of transportation and also because finding a vase the size and shape we needed (very low-maybe 6 inches tall and long-4 feet long) seemed impossible. We took 6 rectangular glass vases and lined each of them with a bamboo/faux leaf ribbon and then stuffed them full of chicken wire. The ribbon would help make the base look green (instead of seeing the stems) and the chicken wire was used as structure to hold all the tall stems in place. Since we designed it to look like one piece once set up, we numbered the vases on the back so that we would know what order to put them up once we got to the church. Once the pieces were filled with foliage, we added a few splashes of orange and purple flowers. Even when it was mostly done in the studio, I couldn’t get the full effect of what it would look like in the space. Once we arrived at the church and set it up, we finished it with strands of ivy along the bottom of the arrangement to add to the look of cohesiveness. I cant lie: I loved the finished product! Working without floral foam may seem like a big jump. Each successful project gives us more confidence and forces us to be more creative. Have you given up floral foam? We’d love to hear how you did it!